Maytag MVWX600XW Bravo X Top-Loading Washing Machine, 4.3 cu. ft. The EcoConserve feature of this 4.3 cubic feet washer uses less water for more concentrated wash and less water consumed. 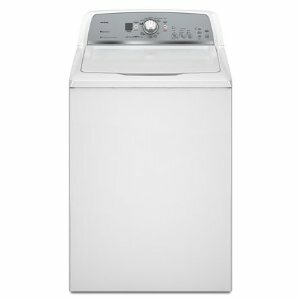 It is Energy Star-rated, which means that it eats less energy compared to other washer units. This washer has 10 cycles with 5 temperature options and 4 variable soil levels. The unit’s 10 wash cycles is powered by the Sensi-Care Wash System w/ IntelliClean Impeller. It features the PowerWash cycle with the Deep Clean and Extra Rinse options. The MaxExtract Extended Spin wrings out more water from garments, requiring lesser drying time for the laundry. Wash cycles consist of a hand wash program, which allows machine-washing delicates such as underwear, especially brassieres. The extra-rinse option is ideal for bleach-treated laundry because it commands the washer to add an Extra Rinse cycle, while the heavily-soiled clothes can be pre-treated using the Soak option. The IntelliFill Automatic Water Level Sensor matches the water level with the load size. This feature and the EcoConserve system use less water than average washers. The washer is Energy Star-compliant, making it more energy efficient with up to 50% energy savings. The washer’s rear control panel includes knobs and a touch pad, while the status of a cycle and its estimated time remaining are displayed in a small LED monitor. It comes with a child lock and an end-of-cycle signal with adjustable volume. To minimize vibration especially during high-speed spin cycles, four leveling legs are attached to the washer’s base. The top of the washer is made of powdercoat-on steel to minimize the possibility of rust-formation. Deep-cleaning and extra rinsing is provided by the PowerWash cycle. The washer’s 4.3 cubic feet capacity accommodates more clothes in a single load.. The IntelliFill sensor automatically regulates the water level according to the size of the load. Less water is used with the help of the washer’s EcoConserve feature and IntelliFill Water Level Sensor. Equipped with QuietSeries Sound Package, this washing machine operates with minimal sound output compared to other models. Even though steam is useful in cleaning stained and heavily-soiled clothes, this washer doesn’t have a steam cycle. This model is not equipped with a built-in heater. With the maximum spin speed of 800 rpm, this washer’s spin speed is lower compared to other models.